Karen's son on the left. A really nice kid. 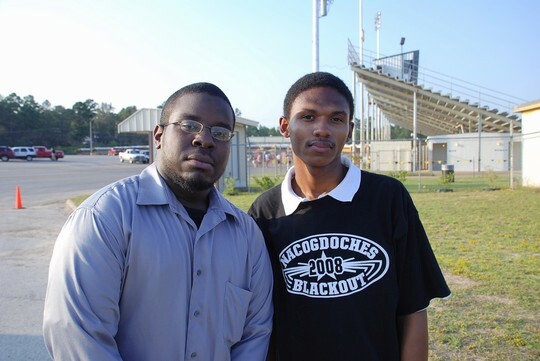 I was at the NHS-Carthage football game on Sep. 19, 2008. I arrived early to take some good pix. I soon struck up a conversation with two kids, one whom I had met earlier that day during his Choir class, another who was just really friendly. I don't know why but I said something about being in the Class of 74. The friendly young man told me that his mother was in that class too. I asked him her name and he said "Karen Biggers Tutt." I had to give him a big ol' hug. Karen was such a sweet person, she was one of my friends. I remember being with her Carlo Brown, Marylin Porter, Alfreddie Parker, Gwen Whitaker and Wanda Richard. We use to have such a good time getting into everything that we could find to get into. We were always getting into party on SFA campus. Karen had a beautiful as well in spirit. Carlo, freddie and I often talk about Karen and Marylin and how much we miss them. Marylin was the quiet one but she knew how to get into thing just a hard as the rest of us could. We always say that Karen is singing her heart out up in heaven and Marylin is being the little nurse that she always was. They will always be in our heart, we love and miss you guys. I will always remember her for her beautiful smile and voice. What nice sons she has. They are a joy and have the great personality of their mother.